I had been looking forward to this one. 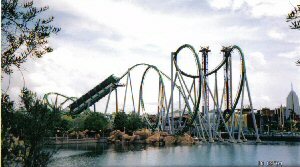 Islands of Adventure was one of the	parks that I really wanted to visit. I entered the park at 9:30 and there was one ride calling me towards it. Looming over the left of the entrance was the green monster Incredible Hulk Coaster. I headed straight for it. With no queue, I headed straight onto the Incredible Hulk Coaster and prepared for the ride ahead. Well, I have ridden many roller coasters, but this was something else. You leave the station and start a steady climb up the hill. Suddenly, half way up, you are blasted to 40mph and sent on a thrilling ride. 7 inversions later you arrive back in the station. This is one adrenaline monster from start to finish. Great. 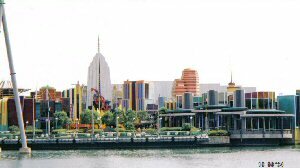 I walked through Toon Lagoon, which I would come back to later, and headed to Jurassic Park. 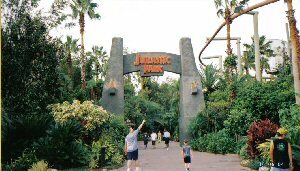 I stopped off at Jurassic Park River Adventure, this is a raft ride through dinosaur habitats, which ends in a plunging escape from a T-Rex. A very nice ride. Then onto the Jurassic Park Discovery Center. An interactive area with lots to do and see, as well as play. After taking some photos from around Jurassic Park, it was onto The Lost Continent, and Dueling Dragons. I was looking forward to this one. Walking through the queue and up into the castle really gets the adrenaline going. I decided to go with 'Fire' for my first run. This was truly awesome. It is a great coaster on it's own, but with the added dueling elements, it only makes it better. What a ride! I continued on through The Lost Continent, and stopped at the Mystic Fountain, pretty funny thing. Anyway, after a few minutes of watching this thing, I ventured onto Poseiden's Fury. This is a walk through ride, which tells the story of Poseidon's ancient temple. I found it OK, but nothing special. I next went through Suess Landing, nothing really interested me here, but I took a walk round and took some pictures. After some food, I was ready to get going again. This time I stopped at Toon Lagoon. I headed for Dudley DoRight's Ripsaw Falls, not knowing what I had gotten myself into. Most good water rides will get you wet, and occasionally there is one that goes beyond wet and gets you soaked. This is one of those rides. There were 3 of us in the boat and after only the first drop we were all soaked. You carry on and after another few drops, you come to the final plunge. Just like the rest of the ride, this leaves you soaked from head to toe. Stepping off, there is nothing you can do but laugh, as the water is dripping off your clothes. This is probably the wettest ride I have ever ridden. It's a good thing it was a nice day. I walked around Toon Lagoon, but for some reason, missed the other rides in this area. I began to head off to Dueling Dragons again, this time to ride 'Ice'. I passed through Jurassic Park again and just had to jump on Jurassic Park River Adventure again. I made my way round to Dueling Dragons and headed towards 'Ice'. 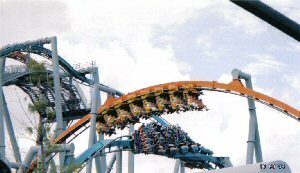 I thought this was the better of the two coasters, but they are both still great coasters. The 'dueling' aspect really adds a lot to the rides, and coming so close to the other is exciting. When going through the vertical loops, you are only 12 inches away from the other coaster. You can almost touch the feet of the people on the other coaster. After getting off, I walked round the park taking some more photos. At around 3:30pm I decided to leave the park. 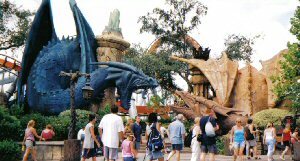 This was a great day out and Islands of Adventure is possible one of the best parks in the world.